Due to its benefits of shortening development time, increasing product quality, and enhancing user satisfaction, the adoption of Agile software development practices is ramping up in all industries. Through its advanced capabilities and dedicated Scrum Template, codeBeamer ALM greatly supports the use of Agile and its various related frameworks, as well as the scaling of Agile for enterprise use. codeBeamer ALM support the use of various Agile project management methods throughout the entire lifecycle, from defining requirements through the development of software, all the way to release and operations & DevOps. It comes with a dedicated Scrum template out of the box to help teams work with this Agile methodology. The scaling of Agile is supported by a variety of features, as well as Intland’s SAFe® Template, a preconfigured template to implement the Scaled Agile Framework in an enterprise setting. codeBeamer ALM provides a cardboard layer to make the flow of work visible at all stages of the lifecycle. All tasks can be monitored, measured, and reported on by following the cardboard view’s “to do”, “in progress”, “to verify” and “completed” columns. Status changes can be triggered by simply moving the cards. The Kanban cardboard view is a great support tool for Scrum’s daily stand-up meetings, because it provides a clear overview of the flow of tasks from start to completion. A convenient drag-and-drop function can be used to transition between task statuses according to the predefined workflow. The Kanban board also provides a quick overview of the balance between expended resources and WIP (Work in Progress) limits. 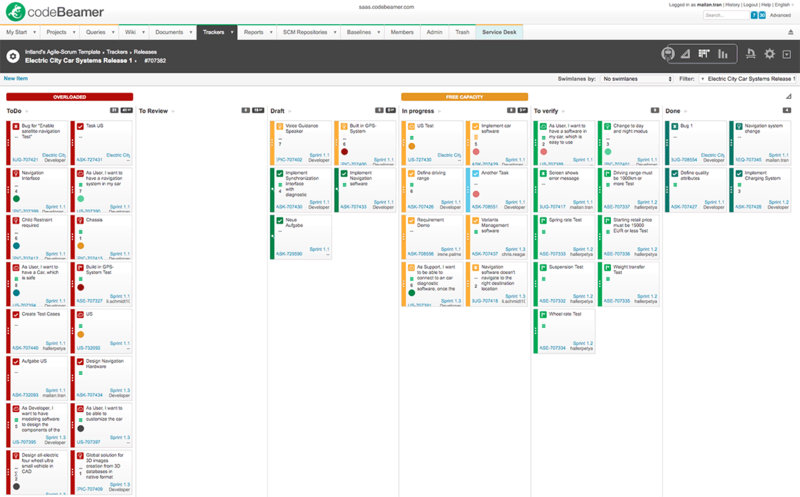 codeBeamer’s Release Planner enables your teams to assign work items to releases, move them quickly and conveniently between backlogs, sprints and releases, and to visualize and manage releases using a Gantt chart. It also allows you to assign work items to project members or teams. Rapid changes to issues can be made without leaving the planning board. Sprint planning: The efficient creation and prioritization of product backlogs is supported by advanced collaborative requirements management features including re-use, change and version control, rating and approval workflows. Collaboration and communication are promoted through the use of wikis, commenting, configurable Kanban boards, permission control features, advanced workflows, triggered notifications and more. Team commitment may be monitored and managed by filtering tasks assigned to each team member, and workload statistics. Velocity: The user-friendly Release Planner provides a simple and efficient overview of the progress made with each project or release. 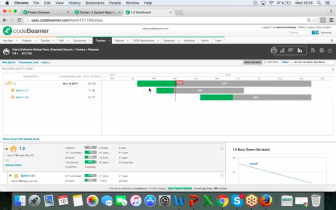 A Gantt chart may be used to visualize parallel releases and sprints, and burndown charts provide an overview of the performance of each project or team. Release planning and management: The system handles story points to help estimate and keep track of the effort needed to cover each task. 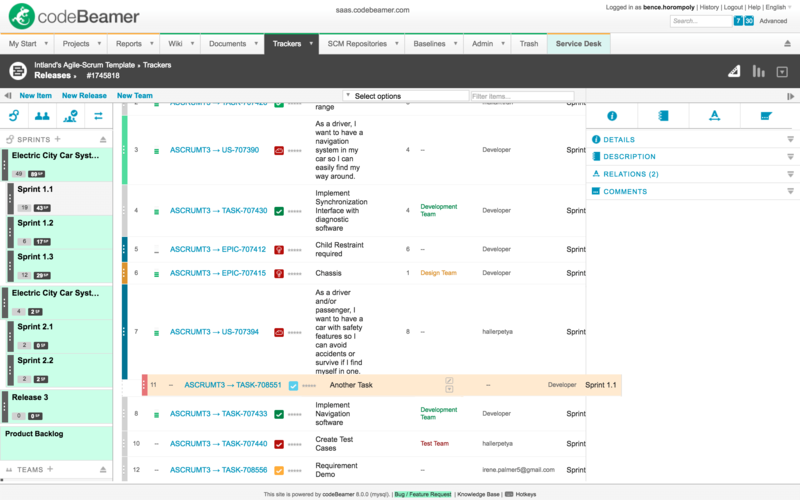 Sprints, releases and milestones are all managed in the Release Planner, and tasks may be filtered by sprints or releases. Daily stand-up meetings are facilitated by a combination of several of the above features, along with a Kanban board to track to-do and WIP (work in progress) tasks. QA & Testing: Parametrized, requirements-based test cases may be saved to libraries for later re-use, and executed manually or automatically (via codeBeamer’s Jenkins integration). Requirements-based testing, and test coverage analysis are all supported, resulting in faster, more accurate, and efficient quality assurance processes. 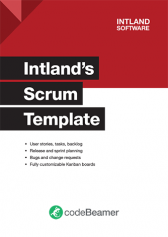 To get access to Intland’s Scrum Template, simply start a free 30-day trial of codeBeamer ALM, and use the predefined Scrum Template when creating a new project. codeBeamer ALM is the first proven implementation of SAFe®, offering a dedicated template to help large organizations transition to Agile using the Scaled Agile Framework.